Ask any Puerto Rican what their five favorite foods are, and we're willing to bet at least two involve plantains. The plantain. The larger, tougher cousin of the softer, sweeter banana cannot be eaten raw, but when you cook it (and depending on how you cook it), you'll discover a versatile ingredient that is incorporated into some of Puerto Rico's most beloved and popular dishes. Green plantains have a starchy, bland quality to them (until you season them up, of course), while ripe plantains are sweeter. You'd need to go out of your way to leave Puerto Rico without sampling the ubiquitous plantain, and honestly, we don't recommend you do that. Instead, try one of these delicious dishes, all made with the tasty platano. I've lost track of how many times I've tucked into one with relish, but I do remember the one I had at Don Tello was outstanding. And if you want to mix it up a bit, try a trifongo, which is made with green plantain, ripe plantain, and yucca: Vejigante Restaurant at the Luquillo kiosks has a delicious recipe. The quintessential side dish to practically any meal, tostones are hard baked cakes of mashed green plantain that generously seasoned with salt. They are often served in lieu of bread and are a wonderful accompaniment to seafood dishes. At El Trapiche, for example, you can enjoy tostones with an outstanding and biting fresh octopus "salad" while Aguaviva cleverly serves them up with their signature ceviches. Along with tostones, amarillos, or maduros as they may be called, aren't unique to Puerto Rico. But they sure are popular here, and with good reason. The sweet counterpart to the savory tostones, amarillos, which means "yellows," are absolutely superb when fried until the edges are a crispy golden brown color. You can find amarillos pretty much anywhere in Puerto Rico. They're best eaten when fresh out of the pan. The name arañitas means "little spiders." Don't worry, no spiders were harmed in the production of this food (at least, they shouldn't be!). Arañitas are so named for their shape. 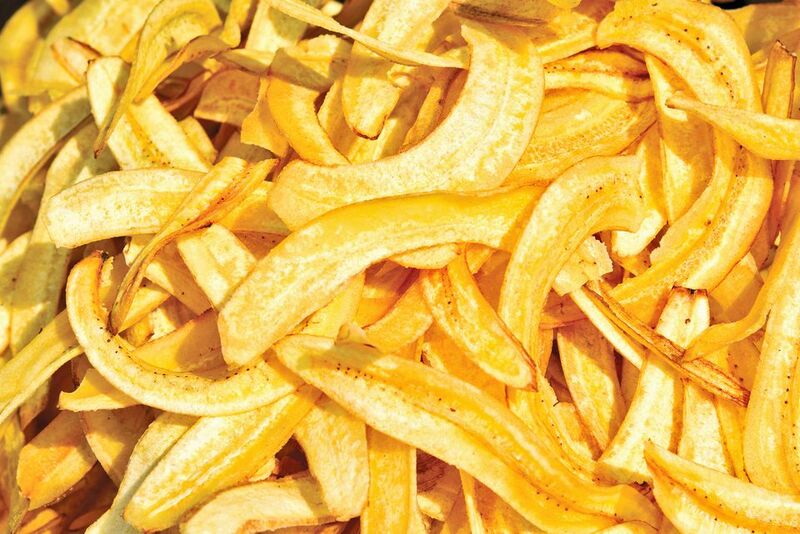 They are comprised of shredded plantain clumped together and fried until crispy. The shreds that poke out from the fried clumps give them their name. You can ignore that as you chomp down on these crispy treats. Do you like lasagna? If you do, you need to try a pastelón, which is a plantain version of the Italian classic. Made with ripe plantains, which are sweeter, the dish is a delicious contrast in tastes and textures. Made with ground beef wedged between layers of sweet plantain and topped off with drizzled cheese, it's ridiculously tasty (if heavy). A very typical Puerto Rican Christmas treat, pasteles are made either with plantains or yucca (cassava) and are filled with pork or ground beef, although there are all kinds of variations on the norm. They are then wrapped in banana leaves and boiled. Pasteles are time-consuming to make and usually turn into a group or family effort. They aren't as easy to find on a restaurant menu, but keep your eye out for them; if you're a fan of Mexican tamales, you're probably going to enjoy Puerto Rican pasteles.